Katie Madewell receives a shot as teammate Lane Carico (No. 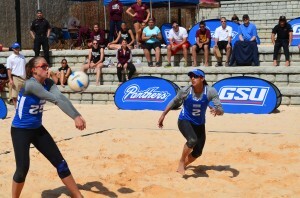 2) looks on during the Georgia State Sand Invitational on April 7, 2013. Carico hopes to participate in the 2016 Olympic Games for Team USA. There are three athletes with Panther ties to keep an eye on as we approach the 2016 Olympic Games in Rio, Brazil. If they qualify, the three will add to the value of the Georgia State brand possibly competing for the USA, Canada and the Ivory Coast. Former Panther, Rachel Hannah, is considered to have a good shot at making the Canadian Olympic team in Rio. Hannah was born in Brampton, Ontario graduated from Georgia State in 2009 with a bachelor’s in Health and Human Sciences in Nutrition. The former Georgia State cross-country and track runner recently competed in the Ottawa 10k road race finishing with a time of 34:53. Hannah’s other notable achievements, according to her profile on the Canadian Olympic Team Official Website include a 25th (2015) and 23rd (2013) place finish in the International Association of Athletics Federations World cross-country Championships. 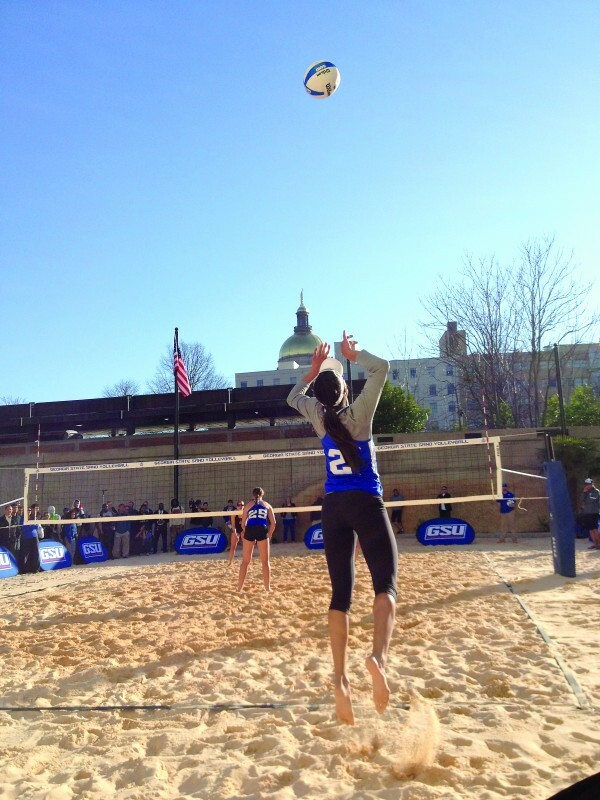 Lane Carico, originally from Manhattan Beach, California, has had quite the success since the 2013 All-American competed for the Panthers in Beach Volleyball. While on the AVP tour, Carico has placed fifth or better including first place at AVP Seattle and most recently second at AVP New York City. Carico was recently interviewed by VolleyballMag.com about her chances of representing the USA with teammate Summer Ross in Rio. Editors note: Carico was not selected for the 2016 USA Beach Volleyball team. Our final Panther with a possible connection to the 2016 Olympic Games is none other than Georgia State volunteer track coach Nene Kamate. Kamate, who according to her Georgia State profile is originally from Jamaica, New York, is working to earn her spot on the Ivory Coast Olympic Team in hurdles. Kamate, a graduate of the Georgetown University, also competed for the University of Florida and the University of Miami. She currently holds the Hoyas school record in the 60m, 100m, 200m and 400m hurdles. The Summer Olympics will begin on Aug. 5 and will continue through Aug. 21.